Visit Steve at Stitches South this weekend ! Guest: Laura Patterson from Fiber Dreams. Laura shares a bit of her backstory and how she ended up as a knitting designer. She also shares what she’s been working on lately. Make sure you check out her great patterns on our site here. You can also check out her site! Fit to Flatter with Amy Herzog, Monday, April 25th – If you can take this class DO! It is a fantastic class! 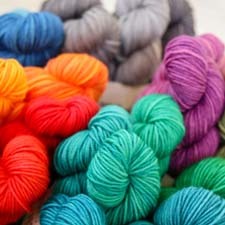 Check out the Valley Yarns Show & Tell on our blog that Kathy mentioned. The Buzz at WEBS on our blog! Check us out on Facebook for Steve’s Deal of the Day! Steve chats a little about Stitches South. You’ll find lots of closeouts and a Deal of the Day just for Stitches, Madelinetosh, Malabrigo, Valley Yarns, Blue Moon Fiber Arts, Berroco. Anniversary Sale yarns that are there will be available at the Anniversary Sale price. Stop by and say ‘hi’ if you’re in the area. History of WEBS – Kathy and Steve talk about how WEBS started as a loom rental business in 1974. Barbara and her business partner Donna also taught weaving in Barbara’s basement. As time went on they added other looms, spinning wheels, and a little bit of yarn. One loom was even displayed on the back porch! By the end of the 1970s, Donna left the business and the first store came into existence. The story continues next week! Next Week you’ll find out more about one of the shops in the I-91 Shop Hop, plus KAL with Kirsten, and more of the History of WEBS! This entry was posted on Saturday, April 16th, 2011 at 9:00 am	and is filed under Authors & Designers, Ready, Set, Knit Podcast. You can follow any responses to this entry through the RSS 2.0 feed. You can leave a response, or trackback from your own site.